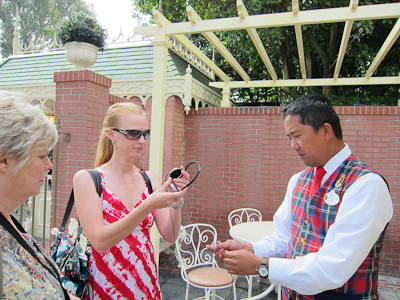 Did you know Disneyland has guided tours? I did. 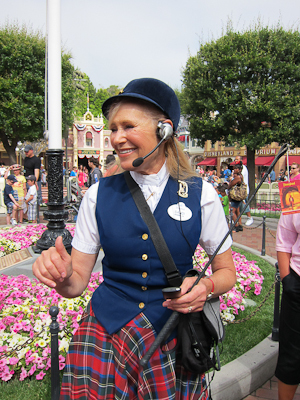 I always wanted to be one of the tour guides, in their plaid skirts and natty vests holding their riding crops like a flag. I also thought guided tours were just for rich people who didn’t feel like reading a map. 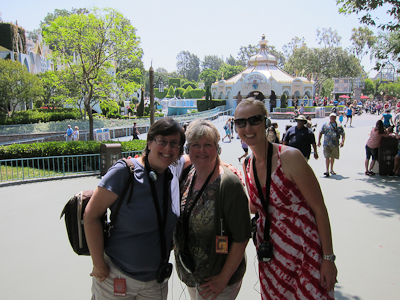 Turns out there’s a variety of tours you can take, including the one I took called “Walk in Walt’s Footsteps.” This tour goes around the parts of Disneyland that Walt himself walked and includes both the tour guide’s telling of history and trivia and Walt’s actual words on recording. 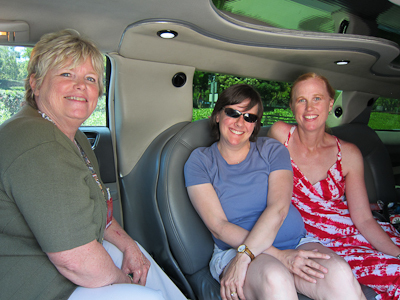 I should also add that I took this tour with my friend Kristin and her mom, Sara. So Kristin has been bugging me to do a tour for MYWTM, and she also has a tradition with her mom where she takes her mom on a mystery trip for mother’s day. 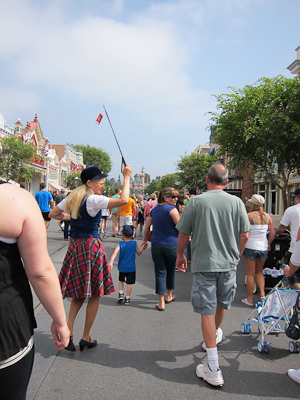 Kristin decided that we should all do the Walt’s Footsteps tour for said trip. 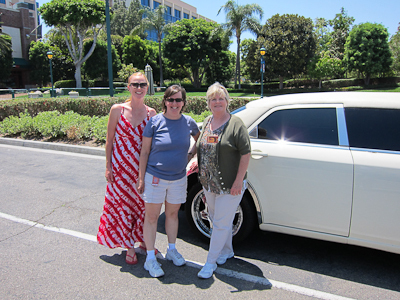 Oh, did I mention the part where Kristin’s brother owns a limo, so I drove Theo to preschool early, hopped into the limo there, went to Disneyland on our guided tour, then took the limo back to preschool and picked Theo up again? Dude, it was surreal. Kristin had also thoughtfully brought mimosas to sip on the way to Disneyland. Everyone needs a friend like her. We were a tad late for the tour (note: they start pretty much on time), but we quickly grabbed our headsets and got caught up. Which lemme tell you, this type of electronic system is miles better than trying to shout to everyone. Our tour guide, Sandi, was very cute. 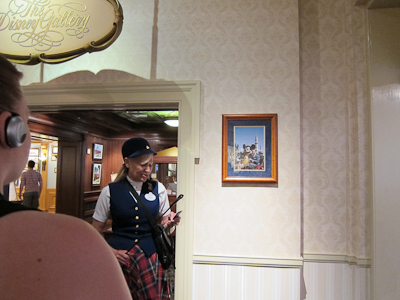 We started in Town Square where I assume she pointed out Walt’s apartment over the fire station. I’ll blog about that later. 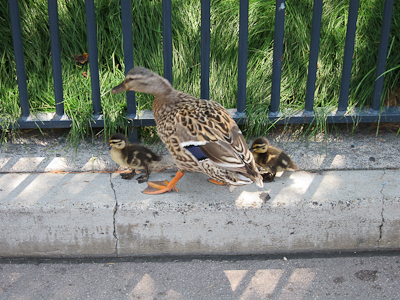 At any rate, we caught up with the group and followed Sandi down Main Street. We stopped at the Hub for some Disneyland history and trivia. 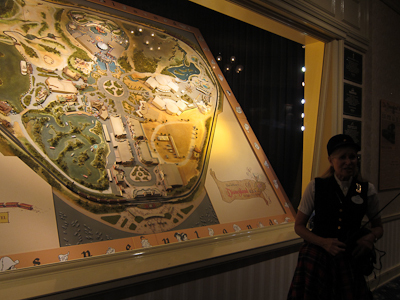 Walt wanted his park to be easy to navigate, so he designed the Hub with entrances to each of the lands. You can see directly into each land (Fantasyland, Tomorrowland, and Frontierland) except for Adventureland. That’s because Walt wanted Adventureland to be an adventure, so you have to walk around the corner to get there. I took a moment to get a shot of Kristin and Sara. 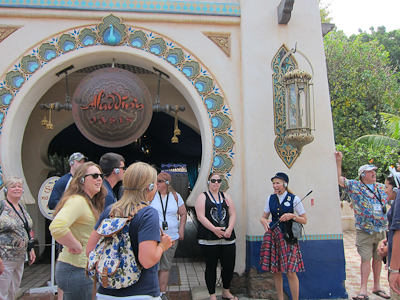 We headed into Adventureland and stopped in front of Aladdin’s Oasis, which was definitely not Aladdin’s Oasis when Walt was there, but it was a good place to look at Adventureland. 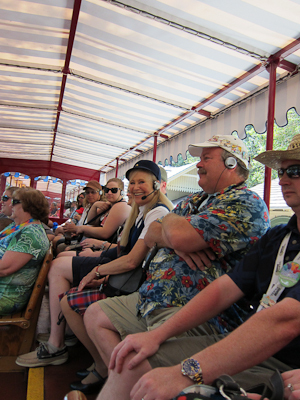 Happiest Tour Group On Earth! After that we went on the Jungle Cruise, and it was nice because we got right on. Being in a tour has its advantages. Plus our skipper was totally awesome. Then we headed to Frontierland where we learned about the Golden Horseshoe, where Walt celebrated an anniversary with his wife, Lillian, and the fact that Walt really like Zorro, so he added some Zorro features. 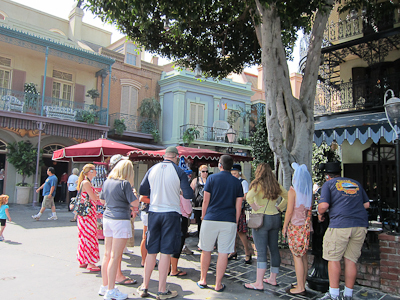 Next we headed to New Orleans Square. Sandi explained to us that New Orleans was a huge interest of Walt’s. He wanted this area to be densely themed, and I have to agree that it really is. It looks like we’re getting ready to buy something here, or maybe watch some entertainment, but we’re actually just a stop on the tour. 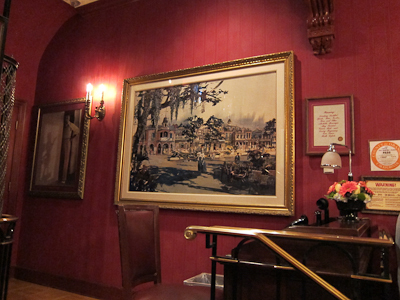 One of the big draws of the Walt’s Footsteps tour is getting to see the lobby of Club 33. 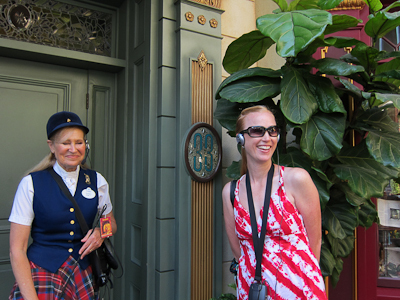 So Club 33 is an exclusive, members-only club at Disneyland, and the only way to get in is to know someone with a membership. 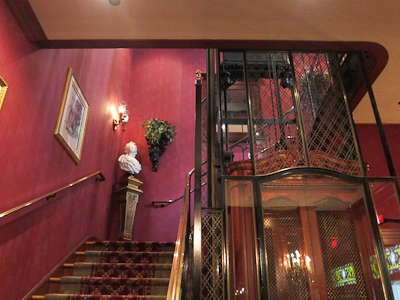 Anyway, so with this tour, we did get to see the lobby, and by lobby I mean entrance. 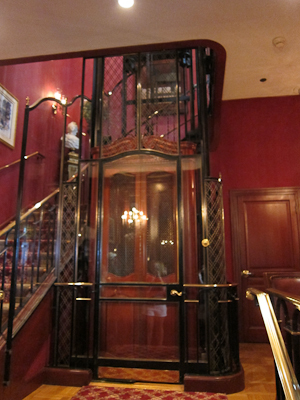 As the story goes, Walt came across this gorgeous tiny elevator in France somewhere and wanted it for his private club (oh, I should probably mention that Walt died before Club 33 opened, so he never got to enjoy it. Anyway…). Walt asked if he could dismantle the elevator and take it to California, at which point the French said, “Non!” So Walt brought his imagineers over to measure it and such so they could reproduce it. And here it is! 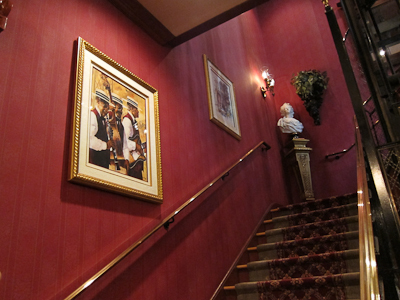 There are stairs leading up to the main level of Club 33. 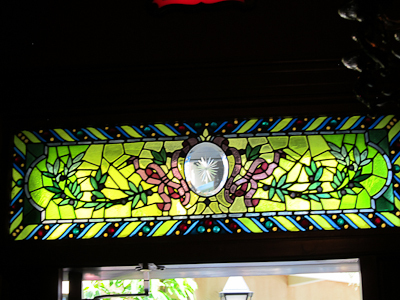 Over the front door there’s a beautiful stained glass window. 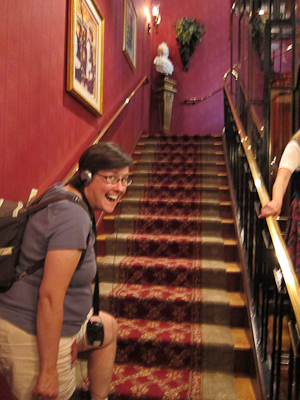 We were told we were only allowed on the first stair, so I faked out making a step to the next level for the sole purpose of getting a totally cheesy picture for the blog. 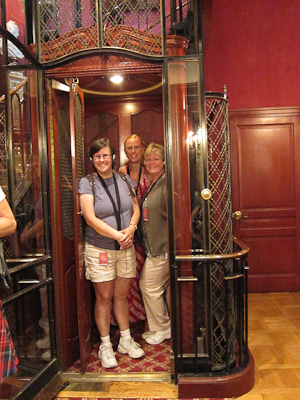 After Club 33, we headed over to the train. We rode the train around to the next stop, Toon Town, or Fantasyland as it was known in Walt’s time. There we got a “comfort break,” which was badly needed. Also we took a picture. We chatted about Walt’s fascination with flumes, leading to both Pirates of the Caribbean and It’s A Small World, and then headed down into Fantasyland by the Matterhorn. There we learned about the Matterhorn being built to hide the big pole from the Skyway (a ride I sorely miss). 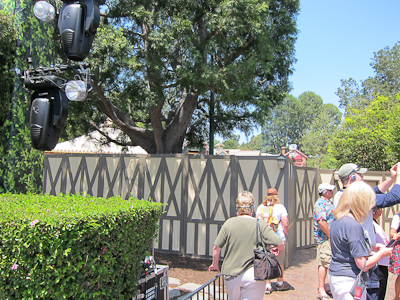 The Matterhorn is behind walls right now, but reopening on June 15th. It has new cars, which we saw being tested. Pretty cool. 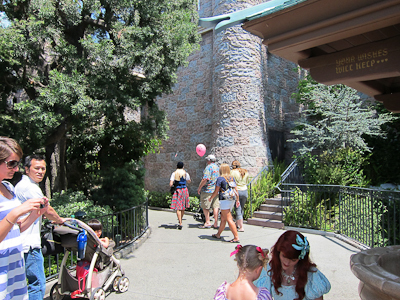 We swung around the side of the castle to Snow White’s Grotto, where we surprisingly ran into Ariel doing a meet and greet with only a handful of people there. Gotta watch those castle passages, I’m telling you! We then chatted about the castle and a little about Fantasyland and the big Fantasyland refurb in 1983. 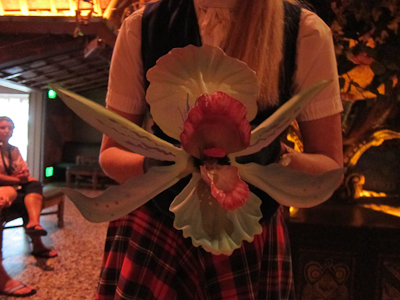 Our guide did tell an interesting story about Peter Pan’s Flight. Unfortunately, the story she told was actually about Snow White’s Scary Adventure, not Peter Pan. But she got the other details right. 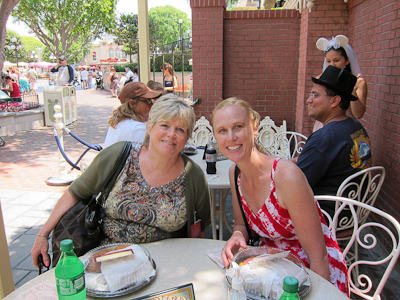 Behind Sandi is the Sleeping Beauty Castle “alternate experience,” a great place to sit and rest on a hot day. While looking at the castle from the front, I got a quick shot of the construction walls around the Carnation Plaza Gardens, which will become the new Princess Fantasy Faire. 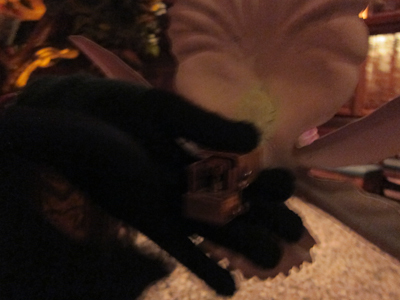 Then we headed to one of Walt’s favorite attractions, the Enchanted Tiki Room. We all got to sit and watch the show, and then afterwards Sandi had a special surprise for us! And the tour part was complete! 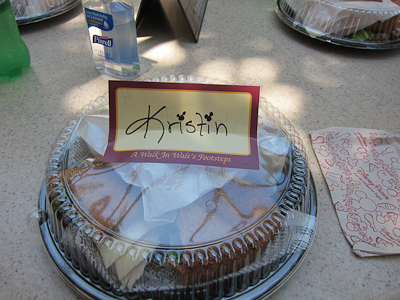 We got a lovely sandwich lunch with our names on our boxes. Lucky Kristin has two i’s in her name. 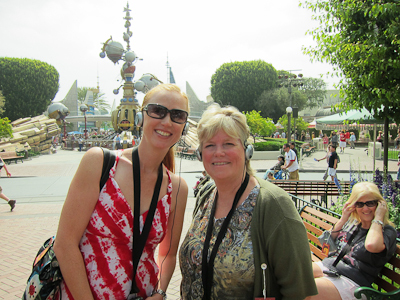 The Walk in Walt’s Footsteps tour was very fun! You do have to pay separately for it, so it’s not something everyone might want to do, but it really was very immersive and informative, even if I am kind of a know-it-all. I did learn several things, though! Thanks for writing about the WIWF tour, Shelby, I’ve long wanted to go on it (after shelling out just to get into DL, I have a problem with substantially adding to the financial strain with a tour). I’m amazed your guide shared misinformation, I would think they would be more careful. I was so excited to see this pop up today. Our trip is in 10 days!!! Yes only 10 days!! I am so excited – we have been planning (and paying 🙂 ) for our trip for 9 months and it is finally here. We are signed up to do the tour while we are there. Thanks for the great preview. Nice post Shelby! 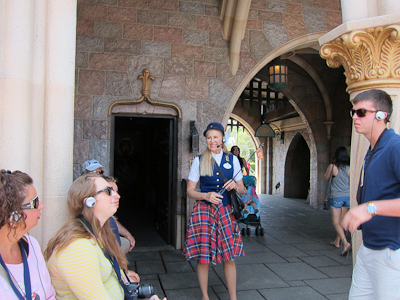 I have often wondered about the Walk in Walt’s Footsteps tour. We had a GREAT time! Thank you so much for joining us! 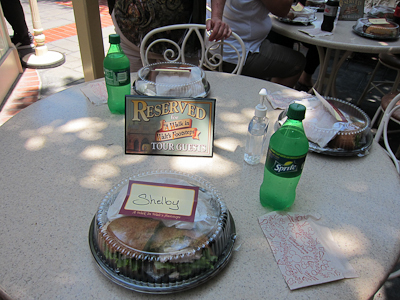 Shelby, I can totally see you being an awesome Disneyland tour guide some day! And how about that plaid skirt with pockets too?! I am so jealous! I just forwarded this to my sister in law. They are huge Disney fans, and I know will want to do this the next time they’re out visiting!